Every now and again, we like to bring you a tip that’s been around for ages, but which may have somehow escaped your attention. Today’s case in point: the way you can highlight text in an email to automatically quote it in your reply. It works in Apple’s email clients and Gmail. Say there’s a particular passage in an email you want to refer to in your reply. Simply select the text before you hit the reply button, and only that text will be quoted in your new message. It can save a lot of confusion and a lot of scrolling, particularly in longer emails, and it works when you’re forwarding emails on as well. It’s actually been a standard part of a few email clients for a very long time. The trick works in Apple Mail for iOS and OS X (though not in iCloud on the web), and it’s also available as an optional Labs feature in the settings for Gmail. 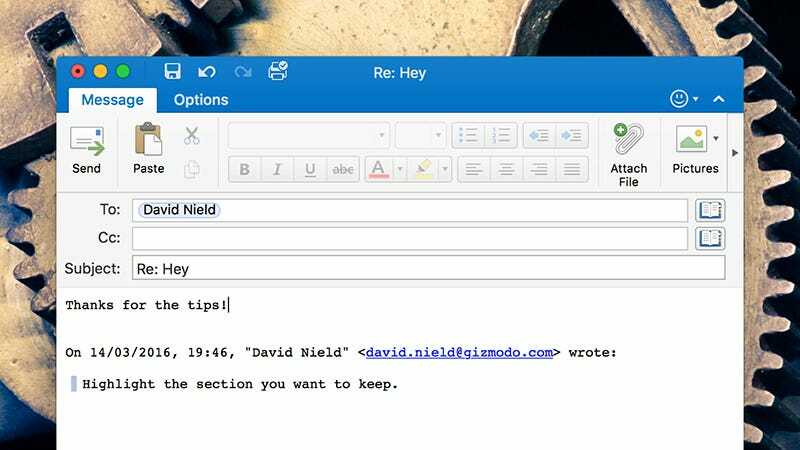 You won’t find it in Outlook on Windows or in your browser, but it does work in the latest Outlook for Mac.